Kings Lynn Millfleet smockmill was an oilmill that crushed linseed. It was erected on a brick base that had a stage set on it and was later converted into a house after the mill had been dismantled. The above photograph shows Greyfriars church in the foreground with All Saints Church at South Lynn in the background, behind the mill. The tower of All Saints Church collapsed in 1763. Tower Field referred to Grey Friars Tower. The mill produce colza oil from cole seed. 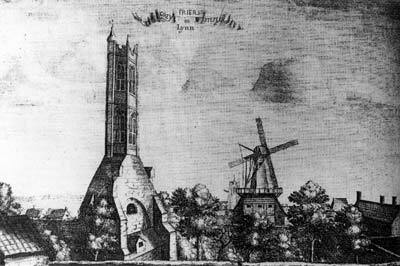 During the 18th Century an oil mill might be seen in the Tower Field. On its site a "Tar Office" where pitch was converted into tar subsequently stood. Re. 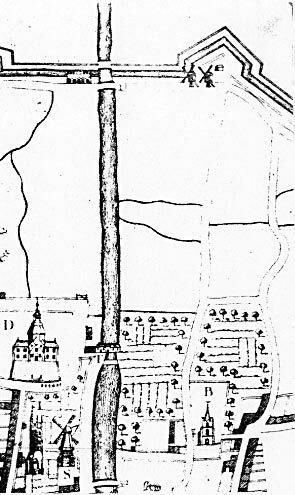 engraving of the West Prospect of Lyn Regis, which dates from before 1700; two oil mills are shown and described in the index as such, one outside the South_Gates and the other near the Grey Friars Tower. These mills probably crushed rapeseed grown in the Fens and produced colza oil, which was used for lighting purposes. Nothing more is known of the South_Gates_Mill, but the other one belonged to Henry Bell the father of the architect and engraver and Mr. Bradfer Lawrence tells me that he has the original lease of the mill dated about 1680. 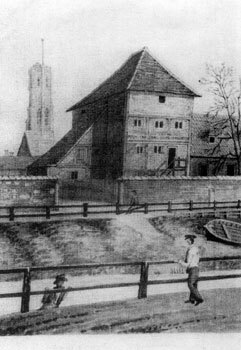 In the Greenland Fishery Museum there is a rare print engraved by Henry Bell the younger, of his father's mill showing the Grey Friars Tower and the surrounding premises. Henry Bell was elected mayor of Kings Lynn in 1692 during the reign of William III and again in 1703 during the reign of Queen Anne. The smockmill was situated near the Millfleet as can be seen from the above photograph.